Mason Works, LLC will assist you in every stage of the project, from material choice to furniture selection. Quality and craftsmanship, with attention to the smallest details are our standards. When you work with Onyx Corporation, you’re getting a partner who will work with you at every stage of your project to ensure it’s done on schedule, on time, and to your complete satisfaction. With our unique breadth of experience in materials and trucking, excavation, and landscape construction, we understand the big picture of your project – from your needs above ground, to those beneath the landscape. Your satisfaction is paramount – and that’s why we do more than simply follow a plan. Whether it’s a homeowner’s landscape design or a large public works project, we look at every detail from start to finish to develop a systematic approach, reviewing your budget and looking ahead to help you avoid expenses in the future. We never sacrifice quality, even if that means working with you to phase a project to meet budget constraints. We use your time – and your money – wisely. Over our more than 30 years in business, owners John and Stacey Durkin have developed a reputation for quality, excellence, and integrity in everything they do. At the core of Onyx is a dedicated and experienced team – many of whom have worked with us for more than 15 years – with a broad knowledge base in horticulture, engineering, architecture, landscape design, and construction. Our depth of experience and pride in our work is reflected in your finished project. We provide landscape solutions that combine a mastery of plant materials, sophisticated construction techniques, and over twenty years of experience in designing, building, and maintaining landscapes. Landscape Collaborative offers imaginative and winning landscape design, construction, and maintenance services for homes, businesses, and campuses throughout New England. We provide landscape solutions that combine a mastery of plant materials, sophisticated construction techniques, and over twenty years of experience in designing, building, and maintaining landscapes of many shapes and sizes. We believe that a well-developed landscape should offer both a reflection of and extension for the lives inside. A garden should be welcoming, offering a place for activity and contemplation. Working with our customers' particular preferences and budget - and the site's constraints -- Landscape Collaborative aims to create a landscape setting that succeeds on all these levels, providing a beautiful space that can be used and appreciated in many ways. Full service landscape construction and maintenance company. We have been in business for over 20 years and provide high quality service with everything we do. Jeffreys Creek Land Contractors has been providing premier landscape construction services since 1985, and has become one of the foremost residential landscape contracting firms to serve the North Shore of Boston. We call ourselves “Land Contractors” because what we offer is quite distinctive from what you’d expect from your average landscaper or contractor. Whether working directly with the client as a design/build firm or working under the supervision of a landscape architect, we consider ourselves part of the clients’ team. Our main objective is to complete our work in a timely and professional manner. When you choose to work with Jeffreys Creek, you choose the very best in industry has to offer. We understand the many elements that need to come together in order to make the project and relationship a success. Our ability to advise clients on how to overcome issues in a cost effective manner is just one of many qualities that distinguish us from our peers. We approach each project with the goal of providing a comfortable, beautiful outdoor space that reflects the clients’ tastes, and allows the land surrounding their home to feel as distinct and comfortable as the inside. By providing well-managed, structured installation practices as well as skilled personnel, we are easily able to fulfill the needs and visions of our clients. *Authorized Unilock Installer* At Garrick-Santo Landscape Company, we employ terrific people, provide excellent service to our clientele, and enjoy sound financial strength through principled business practices. We are recognized as one of the most progressive green Industry businesses in the region. We are committed to excellence in every phase of our business. We know we cannot be successful without the people and the beliefs that unite us, which is why we understand and appreciate our Core Values that have been developed over the last twenty-nine years by our founder, Richard Gottschalk Jr. As we continue on our path to position ourselves as the best Landscape Company, we will look to these values for guidance when we're faced with unexpected opportunities or challenges. Monteiro And Sons Landscape Services, Inc.
With experience and reliability, Monteiro & Sons’ Landscape provides you and your family with a well designed and maintained outdoor living space that can be enjoyed all year long. Our family owned business, with hard working employees and reliable owners, work with you to create an environment suitable for any of your needs. Our jobs range from larger landscape design projects to weekly or bi-weekly mowing, to masonry work such as patios and walkways. Regardless of your outdoor needs, we are happy to care for your landscape. We provide services all four seasons: spring, summer, fall and winter. Please contact us today for a free estimate on any of your outdoor needs. For pictures of some of our work, please check out our gallery! We are based out of Framingham, MA and happily service the Metrowest area and surrounding towns. We service towns including Natick, Dover, Sherborn, Wellesley, Weston, Newton, Sudbury and many more in the area! If you have a question about your town, please give us a call! If we cannot help you, we will direct you to somebody who can. For 21 years, landscape designer Susan Redmond and her crew have been transforming outdoor spaces in eastern and central Massachusetts into remarkable landscapes that provide year-round pleasure. Our staff of accredited landscape designers, landscape architects, and installation professionals work in close concert with clients and subcontractors throughout the design and installation phases, handcrafting each design to fit the client's needs and budget. Start planning that landscape project with Hillside Nurseries! We are a retail (brick & mortar) 3 generation family business that also provides landscape & hard-scape design/build service. We are currently booking work for the upcoming 2019 spring season. We offer our services for those who want to tackle a large job and/or clients that want to plan a large project but want to space it out over time. (We do not discriminate against small projects) Expert knowledge and/or a sound landscape plan is one of the critical components to deliver an outdoor room from concept to reality. 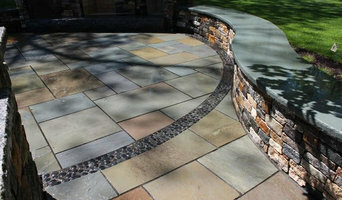 We offer masonry services: Fire pits, bluestone patios, cobblestone aprons, steps/stairs, paver walks or patio and more! Fully insured. Our normal work range is the metro-west region but we do travel outside this area too. We have done projects on the north shore, the cape, southern NH & RI. So give us a call the initial meet & greet is free! Oliver Enterprises, Inc. is a full service Landscape Design and Construction Company. We have been designing, installing and maintaining fine landscapes in the Metro Boston area since 1988. Oliver Enterprises is a full-service Landscape Design and Construction Company. Our goal is to provide the finest level of quality and service in everything that we do. Since 1988, we have been designing, installing, and maintaining properties throughout the metropolitan Boston area. We have a dedicated staff of designers, masons, excavators, and landscape professionals ready to help make your property beautiful. Please look through this site and get to know what we could do for you. Paul Massad Landscaping is a comprehensive design build company offering landscape construction services throughout New England. Our landscapes have been inspiring clients for over twenty five years. We strive to build practical, economical projects with character and charisma. Every landscape, no matter the size, is delivered with complete customer satisfaction. Our business employs a small group of talented designers, site operators, masons and nurserymen who craft the finest exterior living spaces each year. Our team utilizes every opportunity to work with the existing land and develop cohesive designs for your architectural elements. We remain hands-on throughout the process and are highly motivated in our use of reclaimed stone, specimen plant material and responsible landscape products. This genuine passion for local horticulture and native stone results in extraordinary New England landscapes of everlasting value. We have been reviewed through various publications such as Pool & Spa News and recognized with awards from numerous horticultural organizations including the Massachusetts Nursery and Landscape Association, The Arnold Arboretum and the New England Nursery Association. 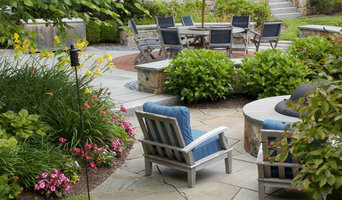 Brookwood Landscape and Stonework Inc.
Lattanzio Landscapes is a Boston based landscape design and build company serving all of eastern Massachusetts. For every landscape there is a variety of possibilities, and we'll collaborate with you to find the best options for your needs and your lifestyle. Our design services range from creating complete landscape plans that consider privacy screening, circulation, the creation of gathering spaces, and plantings for color and interest, to designing specific areas such as entry gardens or other more discreetly targeted areas. The goal of our design work is to help you maximize the use of your spaces. We strive to integrate your home and garden by enhancing the connection between indoors and outdoors and creating a series of spaces that unfold from one to the next. The mood and the character of the garden are considered as well as the function of the space. Interesting use of stonework, a deep knowledge of plants and how they actually perform in the landscape based on many years’ experience landscape gardening, and exceptional craftsmanship and detailing are all part of our designs. We provide installation services and construction management for our projects to ensure the the landscape is faithful to the design and completed with the high level of quality we demand. The practice of Landscape Architecture is not just designing and building gardens. 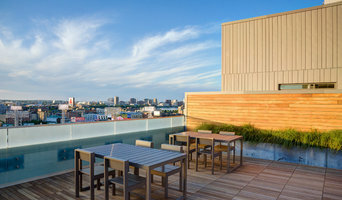 We build relationships with our clients and become the Architects of the entire outdoor environment. Built on the belief that every family deserves an inviting, peaceful and beautiful "garden oasis" to escape to and enjoy together, we work with each of our clients to ensure thorough, prompt, and courteous completion of your perfect landscape. Our focus is always the client, and our passion is creating and maintaining beautiful and inviting outdoor living spaces for you and your family. We enjoy developing long term, working relationships with our clients. David Hancox has worked with some of his clients for 15-20 years. Landscape Oasis is a premier Landscape Architecture firm and David Hancox has been a Landscape Designer and Contractor serving Metrowest and Southeastern Massachusetts for over 35 years. Landscape design, Landscape architecture, Landscape construction, and Landscape maintenance, all from one reliable, professional source. Not gifted with garden tools? Professional Belmont landscaping companies are your best bet to get lush, lovely grounds year round. Hire a landscaper to create and maintain a beautiful yard that complements your home and blends into its native setting. From soil, grasses and plants to decks, walkways and patios, Belmont landscape contractors are well versed in the components that make up a functional and visually pleasing outdoor living space. Learn more about how a landscaping company in Belmont, MA can help you with your yard below. What does a Belmont landscape contractor do? Landscaping contractors execute lawn, garden and hardscaping plans that have been drawn up by an architect or designer. They may also provide design services on their own. After the everything has been installed, landscape companies can make adjustments, maintain plantings, take care of weeds and pests, and perform other tasks to keep the scheme looking its best. A licensed Massachusetts landscaper should have detailed knowledge of Belmont, MA weather and climate trends and conditions, and can choose plants and materials that are well suited to the area. Residential landscape companies in Belmont, MA also handle many of the same general duties as builders, including arranging for construction permits, hiring subcontractors and making sure that designs comply with Massachusetts building codes. Find Belmont landscaping services on Houzz. 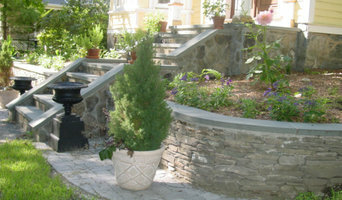 Narrow your search in the Professionals section of the website to Belmont, MA landscape contractors. You may also look through photos of Massachusetts landscapes to find one you like, then contact the landscaping company in Belmont, MA who worked on it.